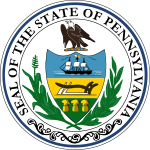 The Pennsylvania gubernatorial election of 1838 was between two candidates. Incumbent Governor Joseph Ritner ran as an Anti-Masonic candidate. Ritner's defeat by Democrat David R. Porter prompted the Buckshot War. ^ Smull, John A. (1870). Pennsylvania Legislative Handbook. Harrisburg, Pennsylvania: State of Pennsylvania. p. 207.